In preparation for an exciting new Resident-led session at the upcoming ODAC conference, titled “My Obsession with CTCL”, I wanted to give you an overview of this broad category of diseases. I just remember my first Dermatology Grand Rounds presentation as a new resident was covering the topic of sarcoidosis. In this discussion, I described how this disease is often called the “greatest mimicker” because it can have variable presentations. However, I truly believe that CTCL should be added to the list of great dermatologic “copycats.” In this article, I will cover the basics of CTCL, but stay tuned…the ODAC session will be a case-based discussion to facilitate your understanding of this disease. So, let’s get to it!!! Cutaneous T-cell lymphoma (CTCL) is a group of disorders characterized by proliferation of neoplastic T lymphocytes in the skin. 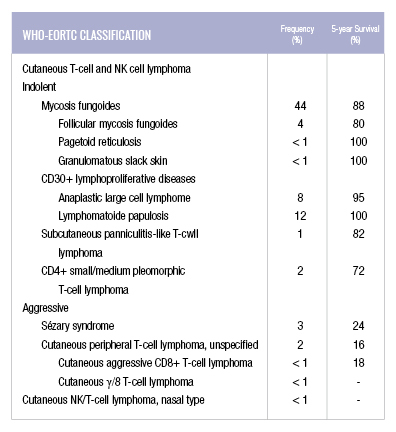 There are several types of CTCL, but Sézary syndrome (SS) and mycosis fungoides (MF) are the most common CTCL variants comprising approximately 53% of all cutaneous lymphomas. SS and MF are diagnostic challenges to clinicians because they can mimic numerous benign skin disorders. In this 2-part review, we will summarize the clinical features and etiology of MF, SS, and MF variants essential for understanding and recognizing the disease in the clinic. The incidence of CTCL is 6.4 to 9.6 cases per million people in the United States. Cutaneous lymphomas represent 3.9% of all non-Hodgkin lymphomas. Mycosis fungoides, which is generally indolent in behavior, has an 88% five-year survival rate and Sézary syndrome, an aggressive and leukemic variant, has an approximately 24% five-year survival rate. The other types of CTCL based on the WHO-EORTC classification can be seen in the table below. Image courtesy of Derm In-Review. Mycosis fungoides (MF) is the most common type of CTCL. Peak presentation of MF is between 55-60 years and predominantly presents in males more than females. 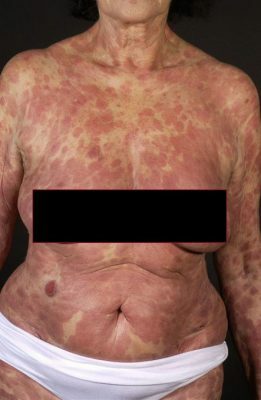 Classic MF presents with erythematous or brownish scaly patches and plaques in non-sun exposed areas, or bathing trunk distribution, that may slowly evolve to tumors. The plaques are well-defined, annular lesions with asymmetrical distribution. Red to purple papules or nodules are present in the tumor stage. Hypopigmentation is most commonly seen in children, adolescents, and darker-skinned individuals. 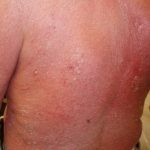 Pruritus is one of the most common presenting symptoms of MF and can have a debilitating effect on patients’ quality of life. Erosions and superinfection are common because patients are often colonized with Staphylococcus aureus. Other clinical phenotypes of MF include keratosis pilaris-like lesions, generalized erythroderma, and diffuse or patchy alopecia. Folliculotropic MF, pagetoid reticulosis (or Woringer-Kolopp type), and granulomatous slack skin are well-recognized subtypes of MF. Folliculotropic MF (FMF) is the most common and aggressive MF variant, which is associated with poorer prognosis. FMF has a preference for hair follicles in the head and neck region. Pagetoid reticulosis is an indolent MF variant that presents with solitary and localized scaling patches or plaques on the distal extremities. 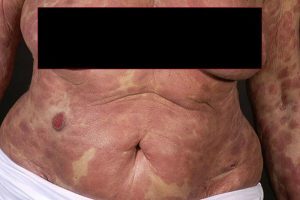 Granulomatous slack skin affects the intertriginous regions and progresses to laxity of skin folds. The etiology of MF is unclear but the current hypothesis includes genetic, environmental, and infectious causes. MF is believed to result from chronic antigenic stimulation that leads to uncontrolled clonal expansion and the accumulation of T cell helper memory cells in the skin. Unlike adult T-cell leukemia and lymphoma, most CTCL patients are serologically HTLV-1 negative. Overall, MF is a significant diagnostic challenge; it has various differential diagnoses especially at an early stage. 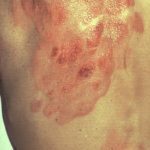 MF typically presents with slow onset and progression of erythematous scaly patches and plaques, often resembling common skin disorders such as eczema, psoriasis, parapsoriasis, or drug reactions. Like MF, Sezary syndrome (SS) tends to affect elderly population and males more commonly with an incidence that is higher in Caucasians compared to African Americans. Patients with SS commonly present with intense, generalized, pruritic, exfoliative rash developing over weeks to months. It is characterized by erythroderma, lymphadenopathy, and Sézary cells which are atypical circulating lymphocytes in the blood and the lymph nodes. The pathogenesis of most of the cases of SS is still unknown. There is substantial data that patients with SS exhibit immunosuppression due to increased production of Th2 cytokines leading to a decrease in Th1 immunity and IL-12. The role of IL-12 is to stimulate the production of interferon gamma and TNF-a; thus, there is a loss of tumor inhibitors. The differential diagnosis includes erythrodermic mycosis fungoides (e-MF), primary cutaneous disorders that may present with erythroderma, drug eruption, and other lymphoproliferative or hematologic malignancies that have circulating T cells. Absent or low Sézary cell count circulating in the periphery helps differentiate erythrodermic MF from SS. Stay tuned for Part 2 of this review, where I will share more on this fascinating topic. If you are interested in attending my working group at the upcoming ODAC conference, click here. Jawed SI, Myskowski PL, Horwitz S, Moskowitz A, Querfeld C. Primary cutaneous T-cell lymphoma (mycosis fungoides and Sézary syndrome): part I. Diagnosis: clinical and histopathologic features and new molecular and biologic markers. J Am Acad Dermatol. 2014;70(2):205-221. Pulitzer M. Cutaneous T-cell Lymphoma. Clinics in laboratory medicine. 2017;37(3):527-546. doi:10.1016/j.cll.2017.06.006. Did you enjoy this post? Find more articles on Medical Dermatology here.